Haiduk are a solo project from Calgary, Alberta, Canada that has been featured before in this zine and plays a blackened form of death metal with a touch of thrash and this is a review of his self released 2015 album "Demonicon". A very dark, heavy and melodic sound starts off the album along with some drum beats a few seconds later which also evolve into blast beats that also dominate throughout the recording along with some death metal growls making their presence known in the songs and the music also gets very brutal at times. Throughout the recording you can hear a great mixture of slow, mid paced and fast parts and when guitar solos and leads are utilized they are done in a very dark and melodic musical fashion and some of the riffs also mix in elements of thrash and the whole album also remains very heavy and brutal from beginning to ending of the recording. Haiduk creates another recording that is in the blackened death metal direction while also getting a lot more brutal this time around, the production sounds very professional for being a self released recording while the lyrics cover supernatural, fantasy, black magick, darkness and nature themes. 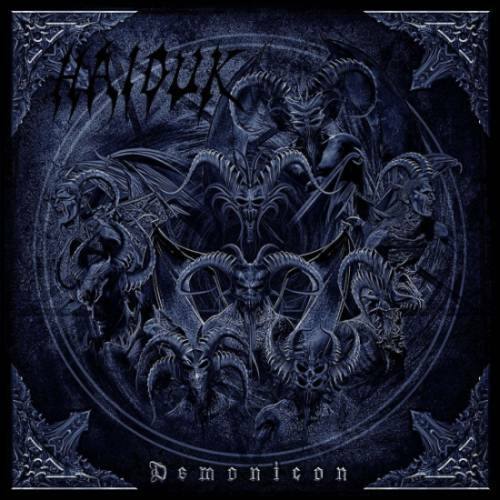 In my opinion this is another great sounding recording from Haiduk and if you are a fan of blackened death metal, you should check out this album. RECOMMENDED TRACKS INCLUDE "Nazon" "Sarxas" 'Nergion" and "Xhadex". 8 out of 10.